The Roland SP404 is a cool little work station for under $400. You can sample with the internal microphone, or plug in a microphone, or use the RCA line in on the back for your turntables or what ever you want. You can also import/export industry-standard WAV and AIF sample files via Compact Flash card from 32MB-1GIG. Cones with built-in 5 minutes of sample time or 11 minutes at lo-fi a feature used to bass out a sample. You get 29 effects, cool BPM light that blinks in sync to the BPM, quick sample edit to catch any part of the sample and real time sequencing. 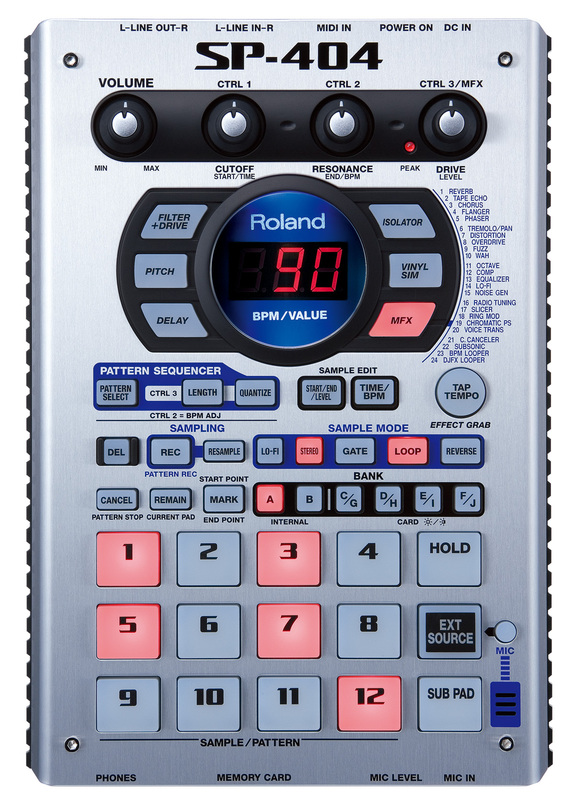 We got ours in Tokyo and had to go online to get the manual after searching on Roland's website we found this 1.04 update that fixes sample export problems. In this video series we cover everything about the buttons on the front and how to use them, then we show you the best way to use the back to plug up some gear, then we sample some sounds, we use the internal microphone and also use the line in to sample, we import some files with our compact flash card, then we use the sample edit and show you what to do and how to do it right..
We cover which is the best way to use the onboard effects like reverb, flanger, delay, Voice Transformer, distortion, filter, Slicer, Isolator, Vinyl Simulator, and more. The SP-404's effects can be applied to multiple samples simultaneously or live input signals so we add it to our samples and I pull out my bass and see how the effects work on the line input. We setup the sequencer to play multiple patterns. We explain all about quantizing the patterns you make up so they play back the way you played them. Then we cover the best ways to sync it up with a computer system like protools and we show you how to use midi to sync with our MPC500. Next we cover the most important procedure yet saving and loading your data to a compact flash card, the best way to do it, and how to use it when streaming form the card so you can use all 96 sample allowed on the card of your choice, and if you need samples we got them. It a cool machine and fun to use since it's all in one neat package. Our videos cover it all, and with our easy to understand instructions, you can't go wrong.